CULVER CITY, Calif. (Oct. 20, 2014) - Sony Pictures Television's modern-day, gun-slinging police drama on FX returns when Justified: The Complete Fifth Season arrives on Blu-ray(TM) and DVD Dec. 2 from Sony Pictures Home Entertainment. Timothy Olyphant (This is Where I Leave You) stars as rugged U.S. Marshal Raylan Givens in the critically acclaimed series from Sony Pictures Television and Bluebush Productions. 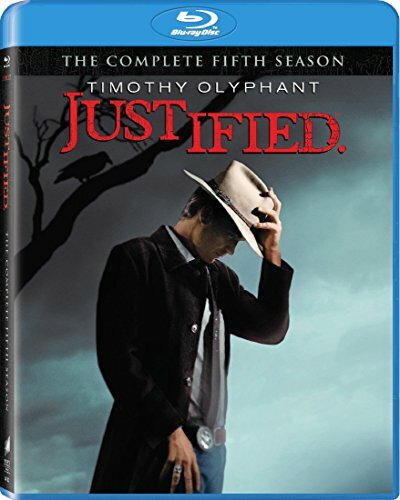 The renegade style of justice continues in the fifth season as Raylan's involvement in a mobster's questionable death is under threat of being exposed. With Raylan's future in doubt, a revenge attack unleashing a federal investigation throws the Crowes into turmoil and puts Boyd Crowder on a collision course with the law. Both the three-disc Blu-ray and DVD sets feature commentaries on two episodes, deleted scenes and Season of the Crowe: Making Season Five, giving fans an in-depth look behind the scenes of the fifth season as the Crowes invade Harlan. The Blu-ray is packed with exclusives including a tribute to the one and only Elmore Leonard, featuring interviews and passage readings by Robert Forster, Tony Goldwyn, Timothy Olyphant, Patton Oswalt, Danny DeVito, Adam Arkin, Walton Goggins, Dennis Lehane, Graham Yost and many more. Also included is Patton Oswalt reading The Onion AV Club's hilarious and loving obituary for Elmore, along with an assortment of all-new featurettes giving viewers a behind-the-scenes look at some of the best moments from the season. The fifth season is already available on EST. Justified: The Complete Fifth Season features an extraordinary ensemble cast, starring Olyphant, Nick Searcy ("Hawaii Five-0"), Jere Burns ("Bates Motel"), Joelle Carter ("Castle"), Jacob Pitts ("Person of Interest"), Erica Tazel ("The Office") and Walton Goggins ("Sons of Anarchy") and more. The Emmy(R) Award-winning JUSTIFIED returns for its fifth season with Dewey Crowe heading north to invest a $300,000 settlement from the Marshals Service in a brothel owned by Boyd Crowder (Walton Goggins), but it isn't long before his cousin Daryl Jr. and the rest of their Florida crime family arrive to cash in, too. As Daryl looks to consolidate the business in Harlan, Boyd's efforts to help Ava (Joelle Carter) fix her murder trial run aground, forcing him to reach out to ruthless crime bosses from Lexington, Detroit, and even Canada and Mexico. With the Crowes complicating life in Harlan, Boyd enters into a series of ill-fated alliances that threaten to bring him down and expose Raylan Givens' (Timothy Olyphant) involvement in a mobster's questionable death. With Raylan's future in doubt, a revenge attack catches Art (Nick Searcy) in its crosshairs, unleashing a federal investigation that throws the Crowes into turmoil and puts Boyd on a collision course with the law. Developed for Television by Graham Yost, JUSTIFIED is based on the short story "Fire in the Hole" by Elmore Leonard. The show is executive produced by Elmore Leonard, Graham Yost, Michael Dinner, Sarah Timberman, Carl Beverly ("Unforgettable"), Fred Golan, Don Kurt and Dave Andron. The show is co-executive produced by Chris Provenzano, Timothy Olyphant, Taylor Elmore and Benjamin Cavell. Broadcast Year: FX (2014). Justified: The Complete Fifth Season has a run time of about 558 minutes and is not rated. Episodes include: A Murder of Crowes, The Kids Aren't All Right, Good Intentions, Over the Mountain, Shot All to Hell, Kill the Messenger, Raw Deal, Whistle Past the Graveyard, Wrong Roads, Weight, The Toll, Starvation, Restitution. The Onion Eulogizes Elmore Leonard -- Patton Oswalt (aka "Constable Bob") reads The Onion AV Club's obituary for Elmore Leonard published upon the author's death. The Big House: Prison Set Tour - Production Designer Dave Blass gives a tour of Kentucky's State Penitentiary. Writer's Diary: A Week of Starvation -- Spend a week on set with Co-Executive Producer and writer Chris Provenzano as his episode, Starvation, is filmed. Getting the Shot - Director of Photography Francis Kenny gives insight into the show's distinct look and style. Raylan Givens: Two Roads Diverge - Executive producers Graham Yost, Fred Golan and Dave Andron discuss two characters from Season 5 who represent foils for Raylan Givens. King Lear - Dave Andron, Graham Yost and Jere Burns discuss a key scene from Raw Deal. The Wall of Death: Season Five Body Count - A look back to all those lost this season.